Soak skewers in water for at least 30 minutes prior to using to prevent burning. Take chicken breasts and cut lengthwise, then crosswise to form 1? cubes . Marinate cubed chicken with Wicklow Rapeseed Oil with Chilli and lightly season with salt and pepper. 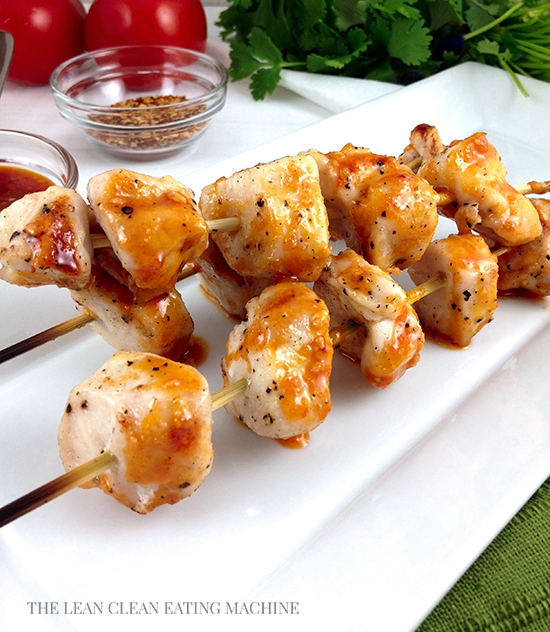 Place about 5 chicken cubes on each skewer, leaving ¼” space between each piece. Set aside covered in fridge until sauce is finished. Start grill and heat to medium/high. 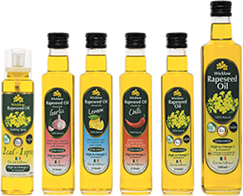 In a small dish, combine minced ginger, garlic, Wicklow Rapeseed Oil with Chilli, and vinegar, whisking thoroughly. Whisk in seasonings and arrowroot starch and set aside. In a small saucepan, combine ? cup water and ¼ cup stevia and bring to a boil, whisking until stevia is completely melted. Continue boiling sugar water and add in chili mixture, consistently whisking until sauce begins to thicken. When sauce has thickened, remove from heat and whisk in 3 Tbsp. honey until well combined. Set sauce aside and start on chicken. Grill chicken for 3 minutes on each side, or until internal temperature is 160F. Chicken will be completely opaque when finished, and juices will run clear. With a basting brush, coat chicken with finished chili sauce, reserving some for extra dipping sauce.